The most common mistakes in a command series tend to come around the word "take." Climbers often use the word in two different ways. Some will say "take" in lieu of the command, "up-rope." Whereas others will say "take" to mean "take my weight." A much larger problem arises out of the nature of a word that only has one syllable. "Take" could also be mistaken for the words, "safe" or "slack." Either of these mistakes could have tragic consequences. The result is that at the American Alpine Institute, we try to teach people not to use the word. 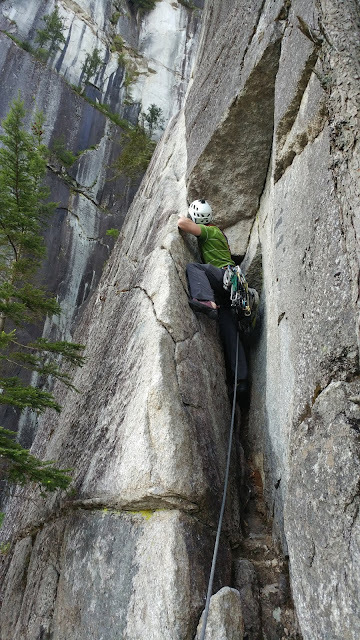 A climber on Angel's Crest (5.10c, IV) in Squamish, BC. Belayer: Thank-you. (Then after removing the device from the rope:) Belay-off. A climber on Myster Z (5.7, II+) in Red Rock Canyon. Awesome list. Will for sure keep these in mind to be more consistant.